Every three months TVK dispatch a beauty box of cruelty free goodies. And they’re usually all full size. Let’s dive in to the first box of the year. Amie Morning Clear Purifying Facial Wash – no harsh chemicals, great for sensitive skin, pH balanced, not tested on animals, smells fairly pleasant. Not sure what else you need – oh and there’s a 25% off voucher in the box. Saturated Colour KISStick in First Kiss (different colours in different boxes) – unfortunately this isn’t my colour, but bright colours and moisture aren’t bad. Barry M Radiant Rod Highlighter – I use this every day, basically a gold crayon that makes me look bright and healthy. I love that Barry M is cruelty free when so many high street brands aren’t. It doesn’t cost more to be kind. 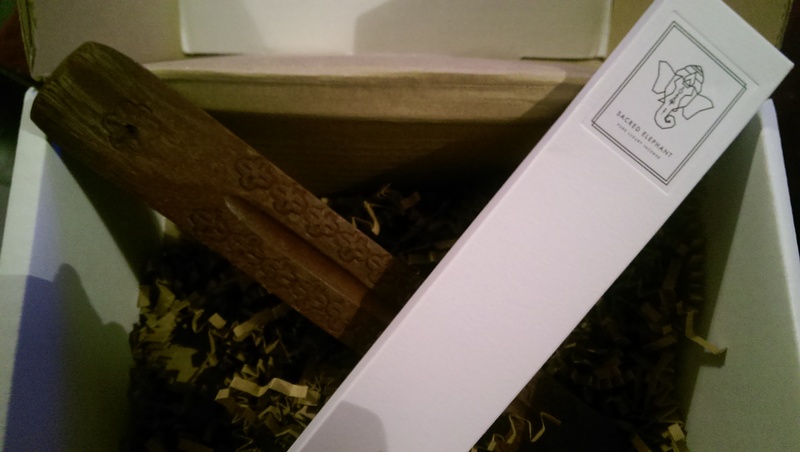 Floral Engraved Wooden Incense Holder and Sacred Elephant Sandalwood Incense – something a bit different, sandalwood is a delicious, woody scent, used all over the world. A donation from each box sold goes to the Dr Hadwen Trust – the UK’s leading non-animal medical research charity. I really like this box, even though the lipstick isn’t my colour, and it saves me a trip to Boots for a new highlighter! Do you subscribe to this box? Share your thoughts below.